With the All-New Hyundai NEXO, Hyundai Motor again takes the lead in fuel cell electric vehicles with the first dedicated hydrogen-powered SUV. It combines the practicality of an SUV with the clean advanced fuel cell know-how. This next generation fuel cell vehicle offers the most advanced technology on the market with autonomous driving capabilities, smart advanced driver assistance systems and strongest powertrains in the segment. NEXO is the technological flagship of Hyundai’s growing eco-vehicle fleet and is built on a newly developed and dedicated vehicle platform. 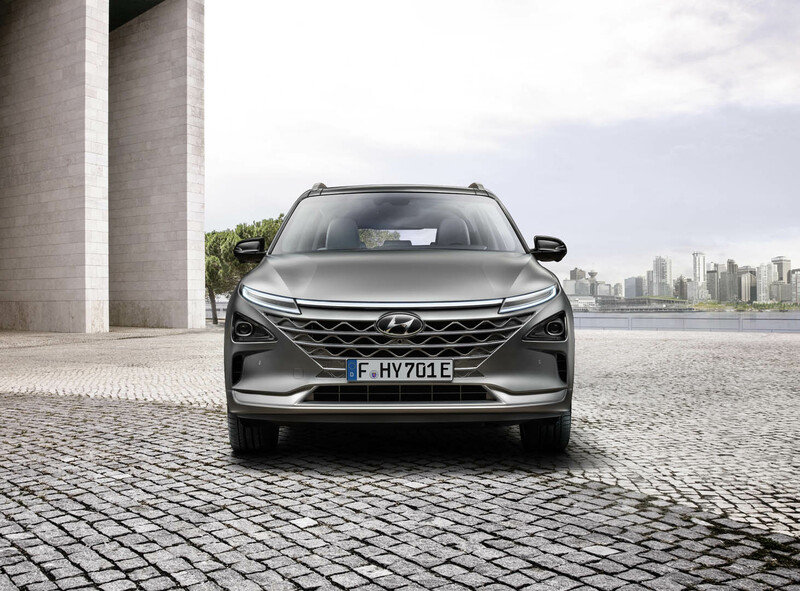 Hyundai Motor calls it a FUV – a future utility vehicle – combining the practicality of an SUV crossover with advanced electrified technology, comprehensive driver assistance functions and innovative and appealing design features. The new NEXO has the best range within the fuel cell and EV car segment of an estimated 800 km (under current NEDC testing) – comparable to an internal combustion engine and allowing drivers to travel long distances. NEXO is Hyundai Motor’s second generation of commercialised fuel cell electric vehicles that will be available across Europe by mid-2018. Hyundai Motor is investing heavily in a future zero-emission mobility already covering the widest range of alternative powertrains in the industry. With the new fuel cell system, Hyundai Motor has taken the comprehensive technology of the previous model further forward. The company is now introducing the most advanced eco-friendly powertrain making the fuel cell technology smaller, lighter and stronger. The new generation fuel cell vehicle improves the air supply system and reduces the already short refuelling times. The overall efficiency and fuel economy put the NEXO in a class all of its own. 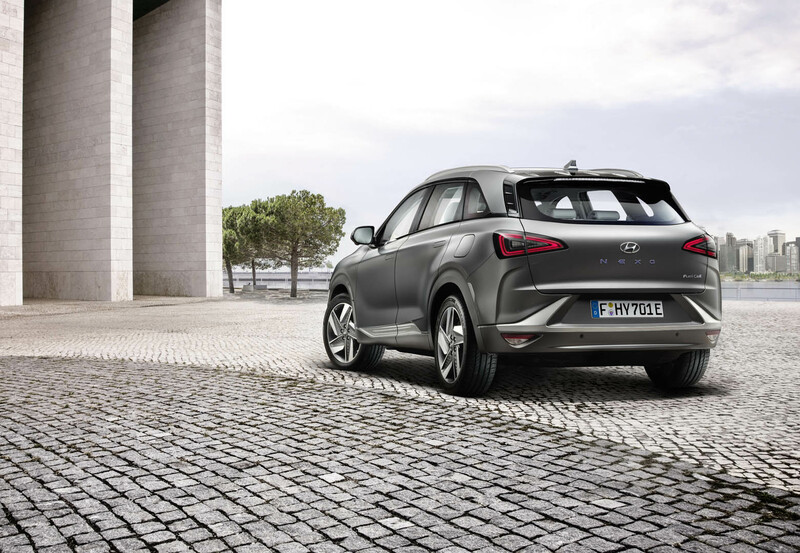 With the ix35 Fuel Cell, Hyundai Motor was the first car manufacturer to mass-produce fuel cell vehicles. 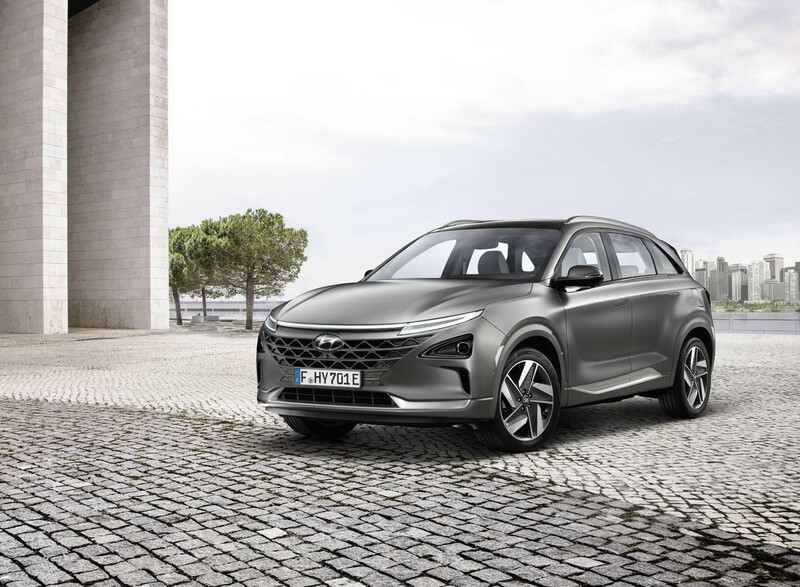 The All-New NEXO is the next model on the European market as part of Hyundai Motor’s eco-strategy to introduce a total of 15 eco-friendly vehicles globally by 2020 to accelerate the development of low- to zero-emission driving. 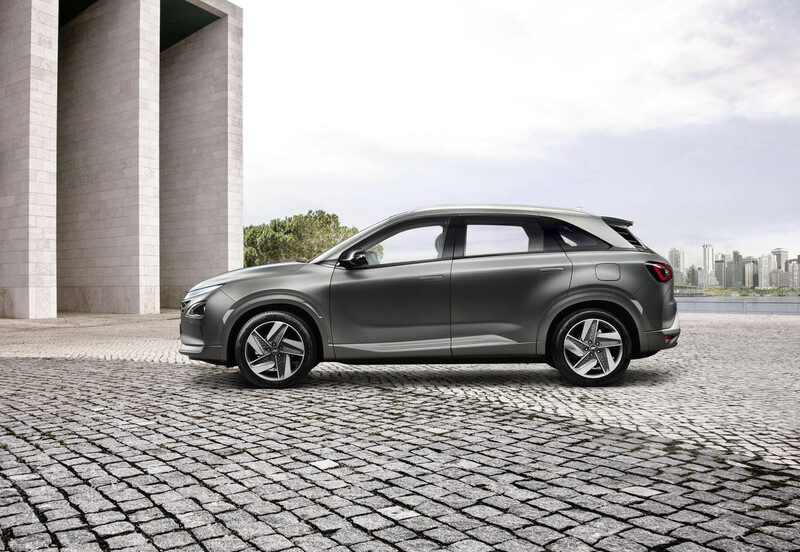 The All-New NEXO is characterised by a pure and calm design emphasising its streamlined silhouette and a floating roof. 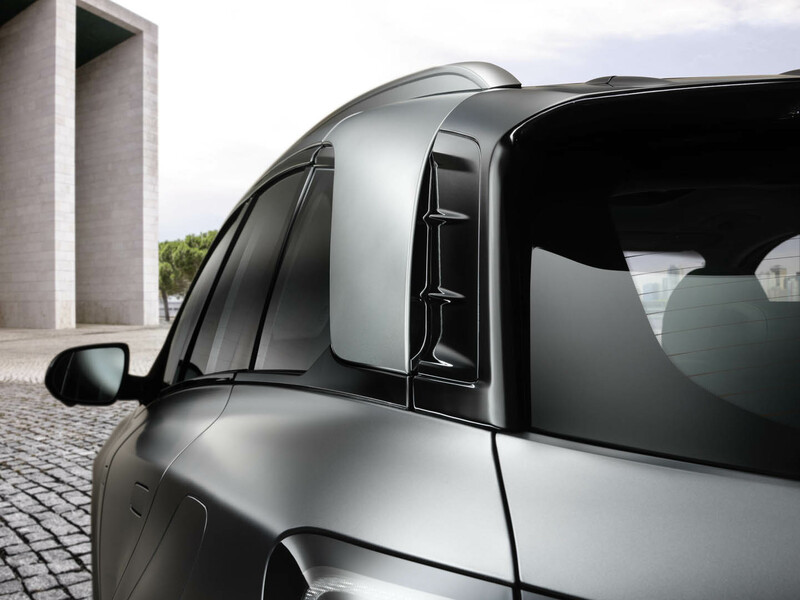 A pure shape engineered to be efficient, yet beautiful, reflecting the style of an SUV. 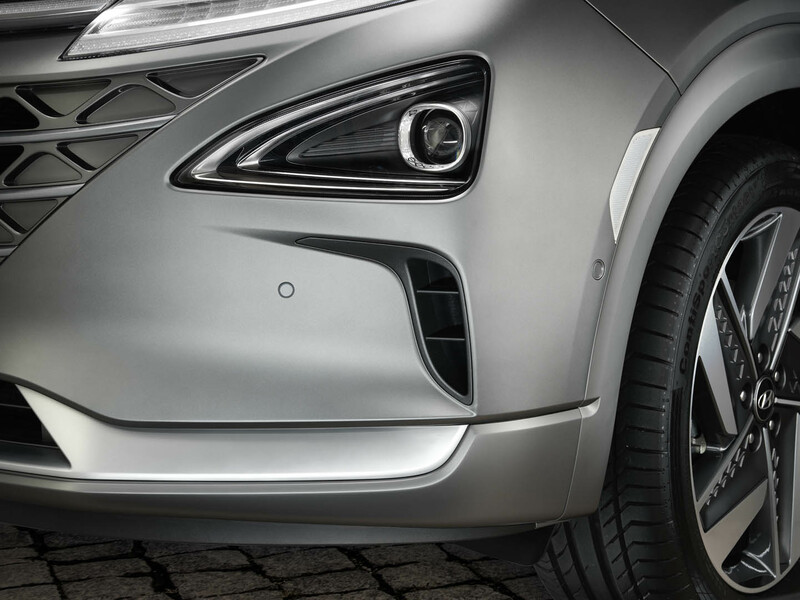 The seamless front appears wide and clearly defined with composite light horizontal full LED daytime running lights. The Daytime Running Lights are linked by a continuous, thin line of light underlining the elegant and horizontal front layout. Triangular headlamps below the Daytime Running Lights emphasise the progressive character of the car. The Cascading Grille has been widened to increase the air intake, rounding off the strong visual impact of the front. The seamless design continues over the side to the rear. The thin, floating roof is emphasised by the large daylight opening and slim D-pillar that runs into the rear spoiler. The rear features an almost triangular shaped window that wraps to the side and a long, prominent spoiler with an integrated rear wiper creating a distinct look. The triangular design of the rear headlamps combined with the horizontal layout of the rear gives the car a strong stance. 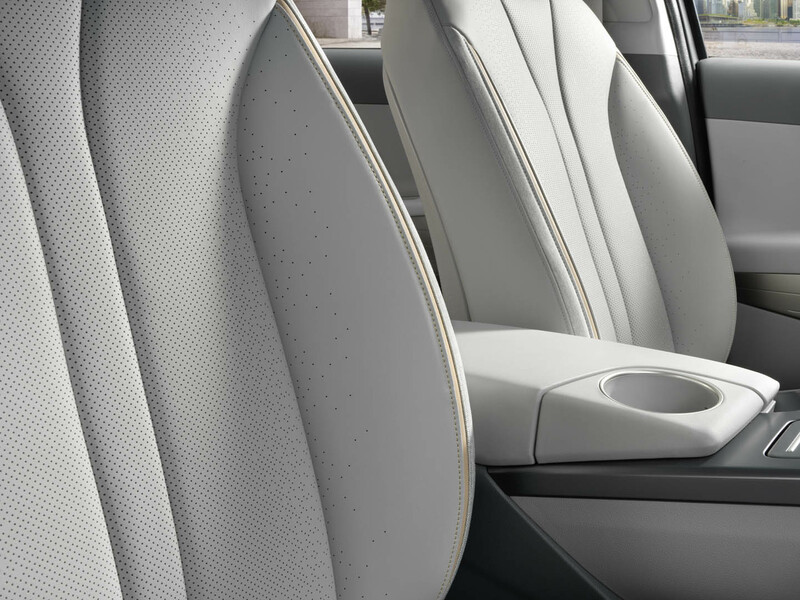 NEXO is the first Hyundai vehicle with integrated flush door handles. 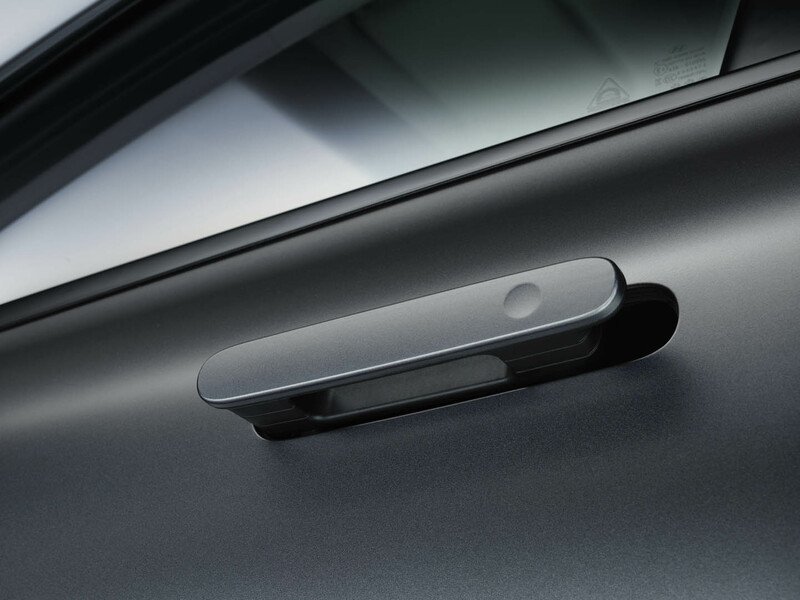 This special handle accomplishes a clean design of the car’s side and improves the airflow. 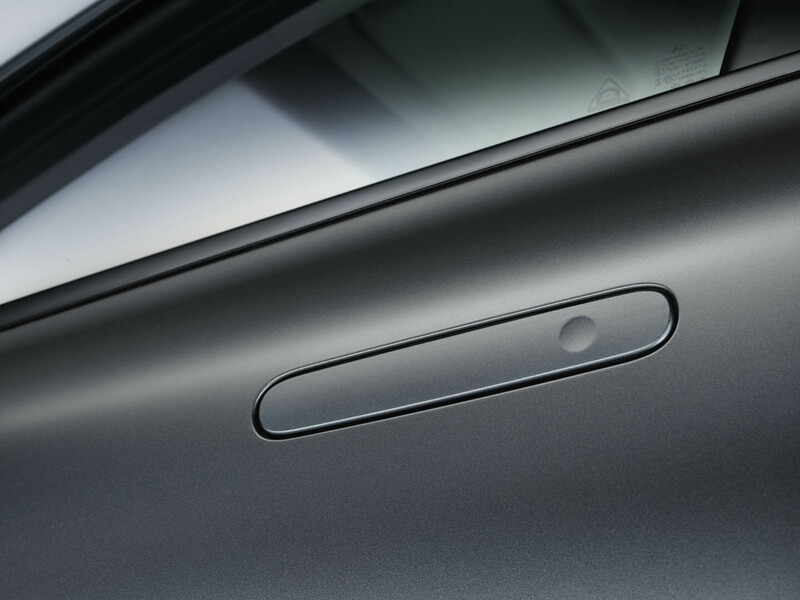 Drivers can opt for automatic deployment of the door handles, either for the driver’s door or for all four doors. The mechanism automatically contracts after five seconds when the car is started. When the car accelerates above 3 km/h, the handles retract automatically. The interior continues the car’s horizontal layout in the dashboard. Most prominent is the wide black dashboard that houses two large LCD displays one of 12.3 inch Navigation system and the 7 inch LCD cluster. The left display holds the digital instrument cluster to show speed, fuel level and driving efficiency. The right screen comes with a new split-screen function and a new home screen for the navigation, connectivity and infotainment features. NEXO’s shift by wire function makes it possible to integrate a free floating central console. This solution leaves extra storage space underneath the console for personal items. 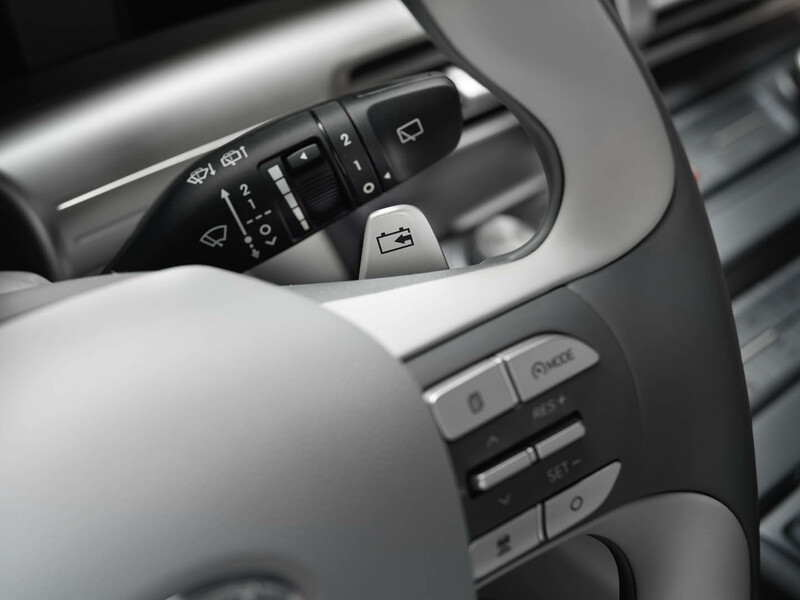 Physical buttons operate the shift by wire, activate drive modes and change the climate settings; the physical control knob accesses navigation functions. A large lower tray holds the wireless charging and two USB ports. The world’s first unified three-tank system with its small tank size allows for better space usage. Additionally, the wheelbase is increased by 150 mm compared to the ix35 Fuel Cell. This results in the best total interior space of any current fuel cell electric vehicle and creates a fully flat luggage area with a luggage capacity of 461 litres (VDA). The design of the All-New NEXO is optimised to reduce the drag coefficient. Multiple aerodynamic features are discreetly integrated into the front, side and rear. The aerodynamics is enhanced by wheel air curtains in the front fender, retractable door handles, a full body undercover and large air ducts as part of the D-pillar. The overall drag coefficient is as low as 0.329. The Hyundai NEXO was designed with new vehicle architecture that benefits the car in many ways: the car is lighter, the battery is relocated to the trunk and the fuel cell system layout is improved. NEXO is the perfect daily-use zero-emission vehicle – living up to Hyundai Motor’s development philosophy of optimum efficiency with zero sacrifice in driving performance. The fuel cell powertrain is lighter and has improved packaging. It achieves a maximum power output of 120 kW (163 PS) and a torque of 395 Nm. NEXO accelerates from 0 to 100 km/h in 9.2 seconds and reaches a class best top speed of 179 km/h. 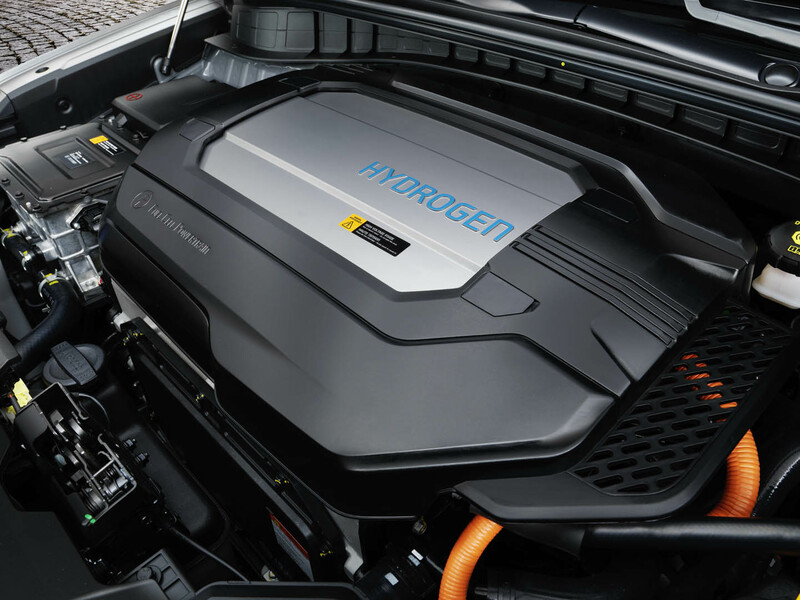 The eco-friendly fuel cell powertrain boasts an increased rate of hydrogen utilisation and component efficiency. This results in the world’s best system efficiency of 60 per cent with a fuel consumption of 3.9 litres per 100 km. The All-New NEXO has the best driving range of an estimated 800 km (under current NEDC testing) – better than any other fuel cell or electric car. This range is comparable to that of an internal combustion engine and allows drivers to travel long distances. The newly developed vehicle platform integrates three identical tanks with a volume of 52.2 litres of hydrogen per tank, resulting in a world-class storage density and higher fuel capacity. Despite the higher storage capacity, the All-New NEXO takes only five minutes to refuel. Designed to handle extreme temperature and environments, the NEXO will cold start even when the outside temperature drops to 30 degrees Celsius below zero in an industry-leading 30 seconds. A highly durable membrane electrode catalyst and new drive control technology give the NEXO outstanding and unprecedented durability that is on a par with an internal combustion engine vehicle: at least 10 years and 160,000 kilometres. Like recently demonstrated in a self-drive from Seoul to Pyeongchang, NEXO fuel cell electric vehicle completed the longest level 4 autonomous driving journey of 190 kilometres. For the first time ever, autonomous cars have driven at speeds of 100 to 110 kilometres per hour over this distance. Entering the highway, the vehicles moved in response to the natural flow of traffic. They executed lane changes and overtaking manoeuvres and navigated through toll gates. Three vehicles based on the NEXO equipped with level 4 self-driving technology, as defined by the SAE international standards, and 5G network technology completed the journey. Adding a small number of sensors to the vehicles has enabled the realisation of fully autonomous driving technology, and thus bringing Hyundai a step closer to the commercialisation of self-driving technology. The vehicles used for the demonstration are “futuristic vehicles” that closely represent Hyundai’s three visions for future mobility: connected mobility, freedom in mobility and clean mobility. The efficient and durable high-performance air filter can filter micro-particulates smaller than particulate matter (PM) 2.5 in size. In short, when air filters through the NEXO, 99.9 per cent of particulates are purified and the instrument cluster displays how much you have contributed toward cleaning the environment around you. 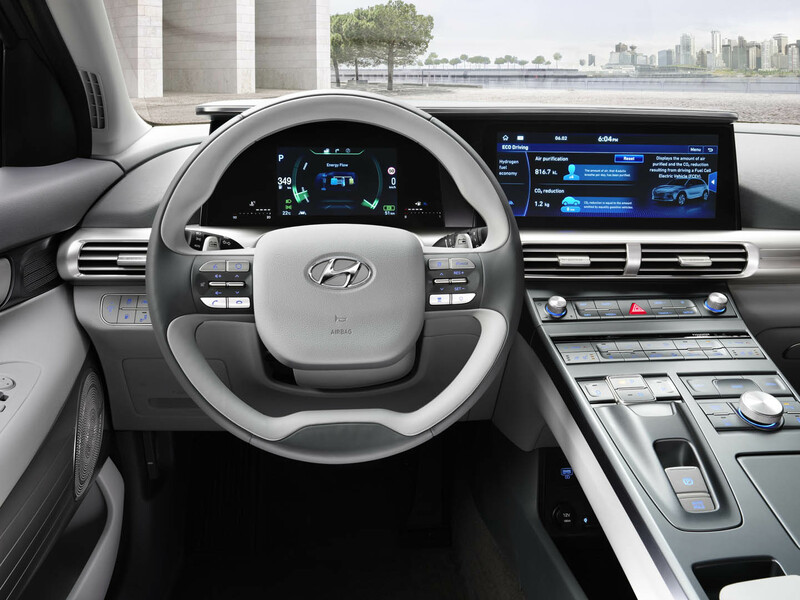 New Advanced Driver Assistance Systems (ADAS) on board the NEXO expand the autonomous driving capabilities of Hyundai Motor. These modern premium product improvements are focused on connecting future technology with evolving mobility challenges. Hyundai’s Blind-spot View Monitor is an industry-first technology. It shows drivers on a central cluster screen the rear left and right and side views of the NEXO using cameras while changing lanes in either direction. The system uses wide-angle surround view monitors (SVM) on each side of the vehicle to monitor areas that cannot be seen by a conventional rear-view mirror. The technology enhances visibility in difficult driving conditions such as darkness or rainy weather. Hyundai is the first carmaker to provide drivers with video footage from both sides of the vehicle. Lane Following Assist (LFA) is an all-new technology for Hyundai and it debuts in the NEXO. LFA automatically adjusts steering to assist the driver to keep in the centre of the lane. It works from a standstill up to speeds of 145 kilometres per hour on both highways and inter urban roads. When paired with Hyundai’s Highway Driving Assist (HDA), which utilises sensors and map data to allow autonomous driving on highways, drivers will be able to travel long distances with greater ease and improved safety. Remote Smart Parking Assist enables the NEXO to autonomously park or retrieve itself from a parking space with or without a driver in the car. The RSPA system can automatically park the car both in perpendicular and parallel parking situations – simply at the touch of a button. Designed especially for challenging parking scenarios or very narrow parking spaces, drivers will be able to park with complete confidence and accuracy. LFA, HDA and RSPA are three of the nine different ADAS technologies included with the NEXO. The Future Utility Vehicle features the latest Hyundai SmartSense active safety and driving assistance features to comply with the highest European safety standards: Forward Collision Warning, Forward Collision-Avoidance Assist with pedestrian detection, Lane Keeping Assist (standard), High Beam Assist with Static Low Beam Assist, Driver Attention Warning (standard), Blind-Spot Collision Warning and an optional Rear Cross-Traffic Collision Warning.